Posted on February 21, 2014	by Katy K.
Dewi is an adorable Welsh red dragon. He’s peacefully going about his business one day when a rat falls out of the sky onto him and starts babbling nonsense. Adults don’t seem to thing anything of it, but Dewi is sure that something is wrong. Soon, Dewi and his pal Jones the toad have turned detective. They find that the evil Baron Doom of Castle Gloomsgor and his assistant dwarf, Peegor, has been running nefarious experiments on caged rats. Can they stop him before it’s too late? The boy and I both (separately) read this early chapter book. He felt it a little too young for him – probably second graders and advanced first graders would be a better audience for this. Perhaps part of it feeling young was the mixing of characters who were mostly talking animals with some human characters. I felt like the characters were animals mostly to add to the fun factor, something that I think is done a lot in picture books and less often the older the age the book is aimed for. I felt like the characters would have worked just as well (and maybe better in some spots) if they had all been human. 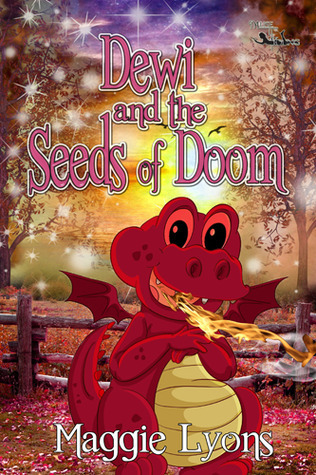 That’s a little sad to say when I love the idea of a book set in Wales starring a dragon! As a short chapter book, it would also have been helped a lot by illustrations. Still, with an exciting plot and quirky characters, this could be the perfect book for a mystery-and dragon-loving kid just graduating to chapter books. This book was kindly sent to me by the author in exchange for an honest review, and will now be headed for the Summer Reading prize cart at my library. This entry was posted in Books and tagged Early Chapter Books, youth mystery. Bookmark the permalink.